Chemical and instrumental textural attributes of chicken breast meat cooked by using different techniques were evaluated in this research. Blanching, cooking in convection oven and microwave cooking methods were used. It was determined that there were significant differences among Hunter a* and b* color values of the samples (P<0.05), whereas cooking loss values of the samples were not different from each other (P>0.05). As determined by using TA-XT texture analyzer, hardness and gumminess values of the samples were significantly different from each other (P<0.05), whereas there were no significant differences observed among the chewiness and springiness values of the samples (P>0.05). As results of chemical and textural analyses, it is determined that most appropriate method for cooking chicken breast was blanching. Chicken breast meat cooked by blanching is determined to be more soft and chewable. 1. Soyer A, Kolsarıcı N: Mikrodalga fırında pişirmenin etlerin kalite özellikleri üzerine etkisi. Gıda, 18 (1): 35-43, 1993. 2. Obuz E: Et pişirmenin fiziksel temelleri. Türkiye 9. Gıda Kongresi, 26-29 Mayıs, Bolu, 2006. 3. Johnston MB, Baldwin RE: Influence of microwave re-heating on selected quality factors of roast beef. J Food Sci, 52: 279-285, 1980. 4. Howatt PM, Gros JN, McMillin KW, Saxton AM, Hoskins F: A comparision of beef blade roasts cooked by micro-wave, microwave-convection and convectional oven. J Microw Power Electromagn Energy, 22 (2): 95-98, 1986. 5. Obuz E, Cesur E: Effects of marinating on the chemical, sensorial and textural properties of chicken breast meat. Flesicwirtschaft, 89 (3): 95-99, 2009. 6. AOAC: Official methods of analysis. 15th ed., Association of Official Analytical Chemists, 1990. 7. Cross GA, Fung DY: The effect of microwaves on nutrient value of foods. Crit Rev Food Sci Nutr, 16 (4): 355-381, 1982. 8. Chen TC, Culotta JT, Wang WS: Effects of water and mi-crowave energy precooking on microbiological quality of chicken parts. J Food Sci, 38 (1): 155-157, 1973. ISNAD Ergönül, Bülent . "Influence of Different Cooking Methods on Quality Attributes of Chicken Breast Meat". 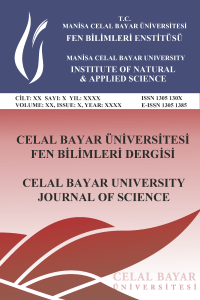 Celal Bayar University Journal of Science 13 / 4 (December 2017): 883-885.